When it comes to the look of bathrooms, the smallest things can make the biggest differences. While having top of the line bathroom fittings and getting bathroom renovations is awesome, improving upon that with a few neat accessories can make it ever better. If you’re confused about how to accessorize your bathroom, have no worries! Complete Bathroom Renovations has got you covered. Okay, first thing’s first. If your bathroom isn’t neat and clean, no amount of accessories can make it look appealing. Read the previous blog on how to keep your bathroom looking like new. Secondly, make sure you don’t clutter your bathroom with useless things. Keep only what you use. Get rid of extra bottles and packs. Organize your cabinets and the basin bottom. Once the clutter is removed, it will be easier to accessorize your bathrooms. It’s a good idea to use towels to add colour to your bathroom. You can choose to use the same colour as your walls, or be a little more adventurous and pick colours that contrast the surroundings. However, it’s important to get the same towels in different sizes if you are after consistency. Getting your bath, hand and face towels monogramed can a great way of adding a customized feel to your bathroom. 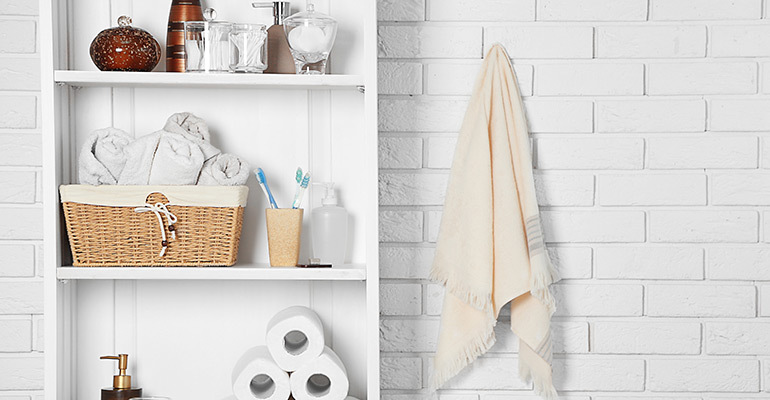 After you’ve chosen your towel set, it’s time to decide how you are doing to display them. You can choose to hang them all, in different places in your bathroom, or you can pick to get baskets. There is a huge range of basket choices based on style and material. Choose what suits you best. Soaps, shampoos, bottles, conditioners, cleaners etc. are part of every bathroom, but what will make your bathroom stand out is the way you choose to display these things. Going for glass jars or steel containers seem to be very popular these days. Some people use special shaped soaps, like for example soaps bars shaped like sea shells. A great idea to keep your bathroom feeling like new is to change your accessories according to themes. For example, you could choose to use different towels and soaps depending on what season it is.